Hi! I'm new to this forum. My fiance and I are getting married at the San Jose Catholic Church and having our reception at the Hilton in October. I was wondering if anyone could give me any feedback on Emeline? So far, I think she's been nice but hasn't been very quick when I've asked her detailed questions. Her prices seem a little steep also. Any feedback on the dj or bands available through her? Any other advice? I have been working with Emeline at the Hilton and she has been great so far! She has a very energetic personality and is super warm and firendly when you meet her in person. 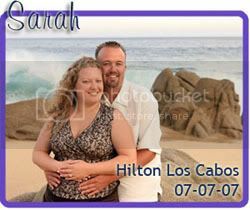 My FI and I went to Cabo last month to check out a few places we were considering for our wedding. The Hilton was our 1st pick initially and after we met Emeline that sealed the deal for us. She has been very quick about getting back to me on my emials - it sounds like you might have caught her at a busy time or something. You need to go with your gut on this but I wouldn't write off the Hilton yet! Hi - thanks so much for your speedy and helpful e-mai. Well, we've already signed the contract at the Hilton. Our date is set for 10/28/06. Her responses got slower AFTER we signed the contract. I'm glad you liked her when you met her. That eases my mind since we'll have to work with her during our actual Hilton stay and wedding. I have not traveled to Cabo. My FI and I are doing this all on a "wing and a prayer" as the saying goes. For some items, I've decided to get pricing on my own rather than rely on her recs. what are you looking for? there are a ton of resources here. good point about using your own vendors. one thing i've been looking for is musicians for our wedding ceremony at the San Jose Catholic church. i'll have to post a thread asking about it. Yeah, I am planning on booking my own vendors for everything. That seems to be the easiest on the pocket book! I don't have any info on musicians (haven't gotten that far yet!) But the girls on the board will be able to help, they are such an a great resource! You will love the Hilton! Everyone does! In general this resort is very service orientated! Check out the reviews from everyday guests on Tripadvisor. It doesn't get much better than that! yes...book your own vendors. it saves money! Emeline is great. THe deal with her is that it is often 2 steps forward and one back. I found that sometimes, i just had to call her to get things worked out!